There is an annual registration fee of $35 for all members. The family registration fee is $60. Summer registration fee for June-August is $15 for new members. 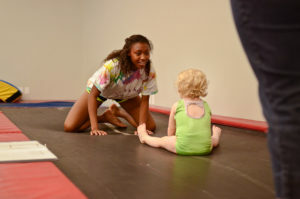 Our trained staff will help parents assist their child with basic gymnastics skills. Our goal is to introduce beginner skills as well as encourage independence & exploration through physical activity. After children learn the basics for all four events, this program is used for perfection of skills. 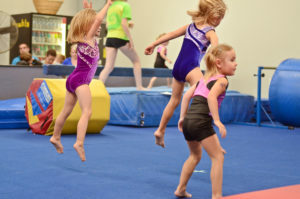 Children will be taught various skills on each of our gymnastics events based upon their skill level. Self-confidence along with teaching proper technique is the focus of this program. This program is structured to develop motor and social skills by exposing your child to a variety of skills which will lay the base to a positive athletic future no matter what the sport. This program is by invitation only. Children with advance skill and knowledge of gymnastics will be placed in this level for skills and more structure. 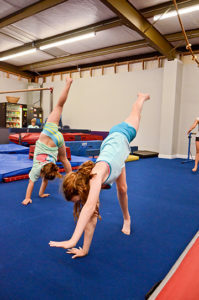 Tuckin Teens is a program designed for gymnasts to work on perfection. This program is by invitation only. Children with advance skill and knowledge of gymnastics will be placed in this level for skill advancement and perfection. Twistin Teens is a program that will allow structure, intense training and accelerated skills. 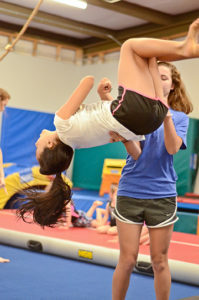 This program is designed for Boys to learn gymnastic and tumbling skills, with a focus on fun and fitness. This program will be a great foundation for increased strength, flexibility, agility, coordination and balance for all future athletic sports. This program is designed to teach tumbling skills to students who wish to learn back-handsprings and advanced skills for cheerleading. Skills will be taught using various equipment including the trampoline and air track. This level is for beginner tumblers to start basic skills and advance placement to students as they learn new skills. This program is designed to teach tumbling skills to students who wish to learn back-handsprings and advanced skills for cheerleading. Skills will be taught using various equipment including the trampoline and air track. This level is for students who have their round off back-handspring and are working on multiple back-handsprings and round off back-handspring tucks. Once this is achieved students will be placed in different level. This program is designed to teach tumbling skills to students who wish to learn back-handsprings and advanced skills for cheerleading. Skills will be taught using various equipment including the trampoline and air track. This level is for students who have their round off back-handspring tucks and are working on round off back-handspring layout and twist. This program is designed to help students get ready for cheerleading. We will focus on cheer motions, cheer jumps. Cheer stunts and tumbling skills. This program will lay the foundation to a cheerleading future for students. Flyin Tots is for the elementary age cheerleaders and will get them ready for middle school and high school. This program is designed to help students get ready for cheerleading. We will focus on cheer motions, cheer jumps. Cheer stunts and tumbling skills. This program will lay the foundation to a cheerleading future for students. Flyin Teens is for the middle and high school age cheerleaders and will get them ready for a future in cheerleading. Please call 336.236.1935 if you are interested, or email us. Attention Parents!! 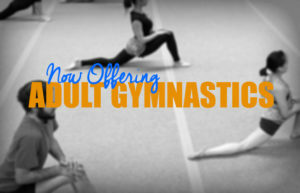 We will be starting an adult class on Tuesday evenings from 7-8pm. The class will be $15 per class and child care will be provided. Class will be open to any person ages 15 and up.